I was looking at the iPhone (iOS) top system bar and one thing was bothering me in particular, but I could not place my finger on it. Yesterday I figured it out. Alarm icon, and rarely, Bluetooth icon. If we segment the top bar into three pieces (left, central, right) each of which has a particular info to convey, the structure is pretty clean. On the left there is info about connectivity, signal strength, wireless, 3G etc. Middle part is reserved for time, and on the right there is battery info. 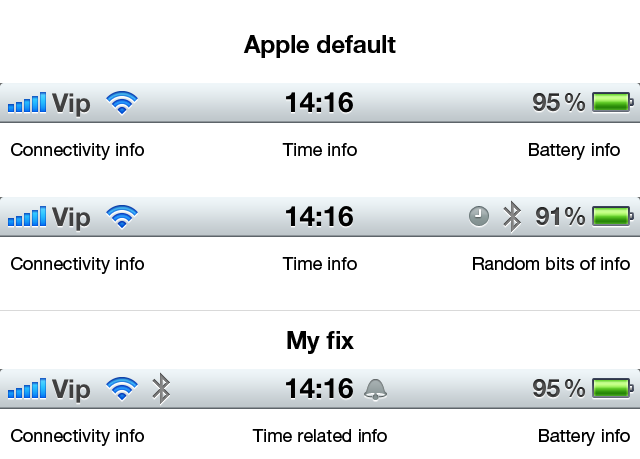 The problem starts when additional icons show up, in particular Alarm and Bluetooth. The Bluetooth icon is an obvious candidate to be moved on the left side since all the connectivity is there. There is no reason to dislocate Bluetooth to the right. Alarm icon has two problems. First, an icon itself. Clock. Clock is a wrong communication on many levels. I can clearly remember few years ago when I first got iPhone that this icon meant nothing to me. I set the Alarm and had no idea a Clock icon means that I have an alarm setup. Throughout user interfaces of the world alarm was mostly represented by a ringing bell. This not only is a better visual communication but also is a logical translation of the ancient real-life alarms (church bells) into digital era. Second problem is the position. When a clock icon appears next to battery icon, what does that mean? It means nothing, exactly. Alarm icon must be placed next to time, because they are both time related bits of information. While doing this I found out this little bit of not-so-perfect design. Three icons, each of them has different shade of grayish color. How did Steve miss that one out? Also, minute-hand is not centered. My OCD is kicking in now, I have to stop dissecting these icons. I’d love to hear explanation for this “feature”. So much tor optical alignment, LOL.